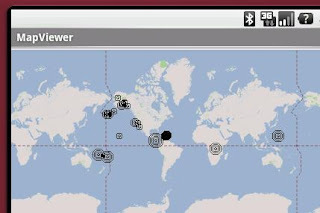 The United States Geological Survey (USGS) has a helpful RSS feed for earthquakes all around the globe. You can find the various feeds here. Here I illustrate how to load the data and display them as an overlay on Google maps on Android. The principal way I have chosen is to have a service running in the background that periodically gets the latest earthquakes and stores them in a ContentProvider. 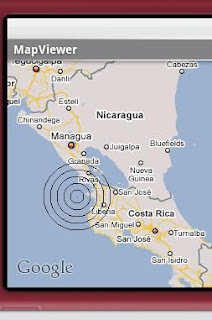 The map overlay queries the ContentProvider for the earthquakes for the given map extent. We start off with the display. The display is an overlay that redefines the draw() method. There are two steps: first to get all the earthquakes from the content provider, secondly drawing them (with a bit of hint on the magnitude). Once I have all the earthquakes, I iterate through the list and display them according to magnitude: one degree of magnitude gets one circle and using the zoom-level I scale this a little bit, so that the concentric circles get smaller if one zooms out, resembling a bit an impact zone. Hey, I am writing an android app using Google Maps and I am having trouble getting correct data for the corner coordinates. I see that you use MapUtils in several of your examples but as far as I can tell this is a class you wrote yourself. Would you mind sharing it? Or if I am just thick would you mind pointing out where it is? Getting the corner coordinates of a map view is not difficult. All it involves is knowing that the projection object has a translation from pixel to geographic coordinates. Then I must have a different issue because when I do a getHeight and getWidth on my view it always returns 0 even though it fills the screen. Maybe I am calling it on the wrong object or calling it before the view is finalized. I was hoping there was some other way it was done. Hmmm, always bad to do some last minute fixes without checking. In my original code back then I had used the getHeight/getWidth on the canvas object, but when you asked the question I thought using the view itself might be better. No time to verify this right now, though. I was trying to follow your possible mistaken lead and see if getting the height/width of the canvas was a way to do this. I can't seem to find anything that will give me the Canvas object to do this though. What code do you use to retrieve the Canvas object? This is part of the code originally posted, so have a look there.